T3 really liked the Google Pixel 2 on review last year, with us praising its distinctive design and character, as well as outstanding camera. However, we found it tricky to ignore the phone's large bezels, with us preferring the aesthetic of the Pixel 2 XL. Naturally, therefore, I was very keen to test out this year's new device for our official Google Pixel 3 review (early verdict), to see just how Google could build on such an accomplished device, but also how it could address its flaws, too. If Google is going to reposition its Pixel range of phones as the iPhone of the Android smartphone world, as has been suggested, then this is without doubt something it needs to nail if it is to challenge the iPhone XS as the current king of our prestigious best smartphone guide. 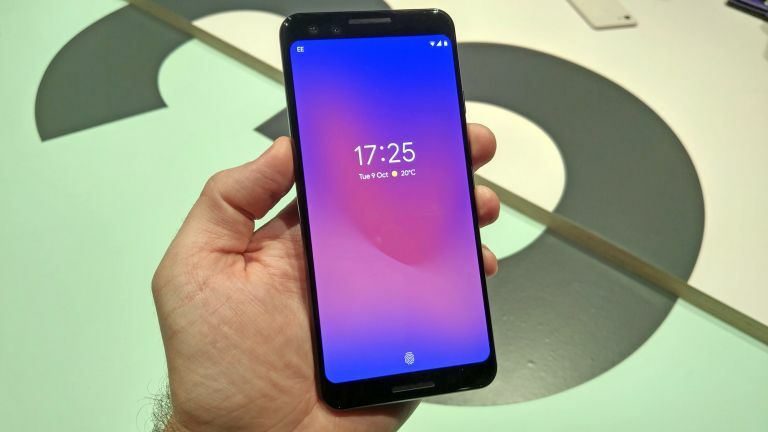 I recently attended Google's own Made By Google event in London, England, to go hands on with the new Google Pixel 3 handset. What follows is my hot take on the Google Pixel 3, as well as all the information you need to know about the Google Pixel 3 price, Google Pixel 3 release date, and Google Pixel 3 pre-order information. The Google Pixel 3 starts at £739 ($739) off contract. In terms of colorways, the Google Pixel 3 comes in Just Black, Clearly White and Not Pink. The Google Pixel 3 is available to pre-order at Google's online store starting on Thursday 11 October, with the phone hitting store shelves on November 1, 2018. On the mobile network Three, the Google Pixel 3 can be picked up on contract for an upfront cost of £99, and then unlimited data, minutes and calls for £48 per month. The Google Pixel 3 retains the two-tone, matte, softly curved design that was evident on last year's range, with the single-lens rear camera positioned top-left of the backplate, with LED flash to the right, and a circular fingerprint sensor embedded two-thirds up down the center. The Google Pixel 3's frame is constructed from aluminium, and the phone is IPX8 dust and water protected. Both the front and back of the phone is covered with Corning Gorilla Glass 5. This felt smooth and premium in the hand, which with the phone costing north of £700 it definitely needed to. Power and volume buttons are located on the right-hand side of the Google Pixel 3's frame, while the device's USB Type-C charging and data transfer port is located bottom center. As you would expect following last year's unceremonious dropping, the headphone port has not returned, either. Fans of notches will also be disappointed to hear that the rumours were true, the Google Pixel 3 does not have a notch, with that feature held for the larger, more expensive Google Pixel 3 XL. As such, the slim bezels on the Google Pixel 3 are uninterrupted, holding its front facing speaker and mic, as well as selfie camera array. The Google Pixel 3 measures in at 68.2mm across and 145.6mm in height. The Google Pixel 3 comes with a 5.5-inch FHD+ OLED display (443 ppi) with adaptive colour profile that, digital saints be praised, is top and tailed by thin, curved bezels that are near-identical to those of the Pixel 2 XL of last year. This, in my opinion, is a no-brainer move by Google, and quickly addresses the biggest issue from the Pixel 2. I also have no truck whatsoever with Google's decision to maintain a notchless screen with the Google Pixel 3, as I am a fan of the cleaner, un-punctured aesthetic. In the hand the Google Pixel 3's screen is crisp and bright, and with a larger screen-to-body ratio, despite only being a tad bigger than last year's Pixel 2, feels far more spacious to the eye. Hardware-wise things are modestly flagship, with a Qualcomm Snapdragon 845 CPU paired with 4GB of RAM. Storage space rests at 128GB, while the Pixel 3's battery is a 2,915 mAH unit. This feels like it could be a little low to me, but until I can test it properly I will withhold judgment. The battery is Qi wireless charging compatible, mind, and supports 18 W fast charging. The Google Pixel 3's camera system consists of a 12.2MP dual-pixel array with autofocus and phase detection. You also get optical and electronic image stabilization, too. The rear camera features shutter lag-free HDR+, which leads to incredibly bright, well-lit photos. Shooting in low-light is, therefore, a very pleasant experience with the Google Pixel 3 and I was very impressed with its shooting capabilities during my hands on testing session. The Pixel 3's camera looks like it is going to be the system to beat going forward into 2019. The Top Shot feature is particularly noteworthy. Thanks to the camera's built-in AI, the Pixel 3 can recognize poor photos and suggest alternate takes of each shot. This helps to heavily minimize the number of completely duff photos taken. I personally feel this is an incredibly useful, use-every-day type feature, as regardless of the Pixel 3's quality, often timing is everything with photography, and Top Shot makes it easier to get that timing right. In terms of video, the Google Pixel 3's camera is capable of 1080p recording at 30fps, 60fps, and 120fps, 720p at 30fps, 60fps, and 240fps, and - in something I was pleased to see - 4K at 30fps. While this isn't best in class video recording, it is highly competitive in my mind. The front selfie camera is capable of up to 1080p recording at 30fps. Oh, and in terms of audio, while the headphone jack remains absent (which I can take or leave), the Google Pixel 3's speakers are 40 per cent louder than last year's range, too. Lastly, in terms of software, the Google Pixel 3 comes running Android 9.0 Pie out of the box, and is fully integrated with Google Assistant. After going hands on with the Google Pixel 3 I couldn't help but come away with the feeling that this might be the ideal phone for users who don't buy into the "bigger screen is better" movement that is currently dominant in the industry. Personally, I love big smartphones, however there is no-doubting that the Google Pixel 3's screen seems perfectly in sync with its overall design language and hardware, offering - dare I say it - an Apple-like understanding that the whole experience trumps spec peaks, and especially so when the experience is aesthetically simple and beautiful. The Google Pixel 3 isn't quite the object of desire that the new iPhone XS is, but its price betrays its differing, wider demographic. One of the major issues Google faced with its Pixel 2 range was that the phones scored well, and were technically good too (especially in terms of camera systems, which remain top-tier even today), but these boons failed to translate into big sales, which in my opinion was largely down to a slightly compromised design overall experience. The Google Pixel 3 seems to have addressed this, though, delivering a genuine Android flagship that appears to have the new iPhone XS very firmly in its sights. Be sure to check back in to T3.com again soon for my full Google Pixel 3 review.